What is worship? What do Friends/Quakers believe about baptism and communion? How does the Quaker business meeting work? 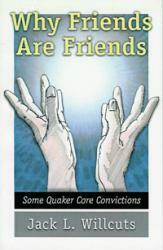 Those acquainted with Friends, and some Friends themselves, find some of the doctrinal differences of Quakers troubling and confusing. Why Friends Are Friends is an attempt to examine the Quaker past and connect it with the present and the challenges of the future. These connections, writes Willcuts, become again our own convictions as we return to the revealed Word and the leadings of the Spirit. This is why Friends are Friends. Topics include worship, the sacraments, the Friends concept of ministry, peacemaking, the Friends business meeting, and living a powerful Christian life.